My taste in single malts usually runs to the more powerful Islays - Laphroaig, Ardbeg, etc. I've had the 12 yr old 'Buna, and recently got the 18. Man, was I blown away!! The depth and complexity of flavors was amazing. Color was incredibly rich and dark, like a deep chestnut or oak. Lots of sherry on the nose, with the sweetness coming through. A definite raisin scent as well, with just a hint of iodine and the salty sea in the background. On the palate, there's lots of fruit and sweetness with the first sip, with some vanilla and caramel, framed by a lightly smoky and "maritime" background. I found it to have a nice long finish, without the mineral or flint remaining in the mouth like most Islay malts. Almost like you had a piece of candy. This is one to be savored and nurtured, and would be a perfect dram on a cold evening. It's definitely not the "standard" Islay, but this is an absolute gem. Sounds so tasty in this review! This one should really be on my proverbial "buy list" someplace—or even just my "try list." I've never had it, and it feels like a significant gap in my malty experience. I love this one. It's one I keep on my shelf on a regular basis. Personally haven't had a bad one yet, although some friends have reported having bottles from a fairly sulphured batch. Such is the risk with sherried whiskies. I really love well made sherried malts. Unfortunately, they are becoming more and more a rare breed. The reason is pretty clear: there has been a drastic decline in the number of sherry drinkers - fewer drinkers means less production which in turn means less casks available for malt distilleries to use to age their spirits. I remember when I lived in Wales in the 1980s there were dozens of brands available in pubs and groceries and sherry was the drink offered at most social gatherings. I was back in London in November and was shocked to discover that the only sherry available at most pubs (if any were available at all) was Harvey's ("a drink for the ladies", I was told). Which is the long way around to this review. I had read some good reviews of the Bunna 18 emphasizing its sherry influence, so when I had a chance to pick a bottle up I jumped at the chance. It is well worth the $110 price tag. This is one of those dark and brooding malts, the kind to drink before a fire on a winter's night. For someone living in the middle of nowhere northern Vermont, it doesn't get a whole lot better than this. Simply put, this is a beautiful dram. By the way, drink more sherry!!! Color: An absolutely beautiful dark chestnut - "natural colour"
Nose: Sherry soaked fruitcake with burnt raisins, nuts and dark fruit. True to its provenance there is a subtle maritime character. This is a nose with which I can spend an hour. Palate: Medium body with an olorosa center. The barley tries its best to keep up but the sherry wins out. Stewed fruit (prunes, rhubarb) fruitcake, and Vermont dark maple syrup. The oak makes an appearance and spices begin to buzz. A tad salty. Finish: Very long with the sherry still holding court. The oak still hangs around but does not overdo things. Spices continue to buzz. @jerryclyde, thanks for your lovely review. 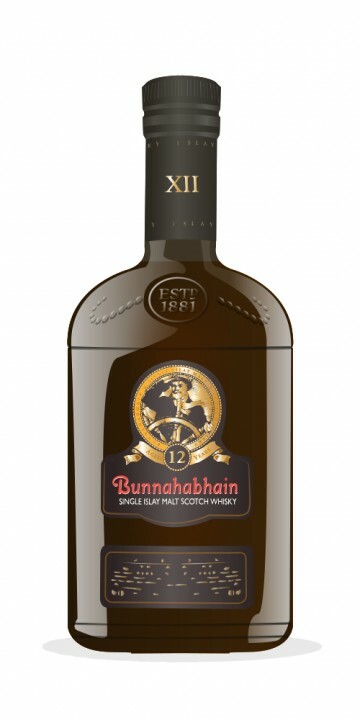 The only time I tasted any Bunnahabhain 18 was from @talexander's bottle in 2011. This makes me very eager to have some more. @jerryclyde, In Ontario, the "duty" on unaccompanied whisky is about three hundred per cent of purchase price...only approximately 100 % when carried across (and declared). There is a 1.14 liter exemption when out of Canada 48 hours or more, upon return. Three years ago I went on a whirlwind tour of Islay. Starting at Bowmore, they had a glamorous "clean" looking modern visitor's centre and reception greeting you straight from the street. We finished at Bunnahabhain - their visitor's centre took a bit of finding. I recall having to wander around the distillery yards trying to work out exactly where it was. Eventually finding it round the back by climbing up a rickety metallic fire-escape type set of steps and wandering into the scruffiest room I saw that day. I make it sound bad but it actually added to the character. Especially when I immediately had a glass of their 12 year-old malt thrust into my hand, which made for a very pleasant welcome. So onto the 18. Bunnahabhain came out from the dark side a few years ago by making the very respectable decision to remove all colouring and chill-filtering from their core range. The first thing I notice about this is just how dark it is. It must have sherry influence but the bottle does not explicitly say so. Nose: Upon pouring I immediately get apples and spices. Sitting in the glass for a while it opens up to reveal raisins, red berries, (yep -typical sherry cask profile), along with sugared fruits. A bit like a stewed plum pudding. Sugared almonds are in there somewhere. Warm spiciness remains throughout. Palate: Marzipan is quite prominent. A summer fruit cocktail - strawberries, blackcurrants, raspberries. Just a hint of aniseed with a peppering of spiciness. Fairly thick and smooth mouthfeel. Finish: Medium-Long. Sweetness remains initially before drying out. It's a nice mellow malt. It's not 'spectacular' but I don't think that is the intention here. The kind of malt that you can just chill-out with, (particularly in winter in front of a fire - so I might leave the rest of this bottle until December). @Nemesis101, great review. I'm curious, did you notice much evolution happen either in the bottle or in the glass? I found this one to be delicious, but slightly too 'sturdy' in the sense that very little changed or evolved over time. @Hunggar - I didn't notice whilst writing the review, but now that I think back you're absolutely right. Not that it's a bad thing - it was very nice immediately after pouring and just the same 45 minutes later. I consider Bunnahabhain to be one of Islay’s hidden gems. Their products boast strong salt and soft smoke, which isn’t for everybody. But they have their own style, and consistently produce quality whiskies. I loved the 12, and was eager to try an older Bunna. But the 18 is not just an older version of the 12 yo. For me the 12 is the experimental and vibrant younger sibling. Oppositely the 18 is the calmer, more refined, but perhaps less bold or exciting older sibling. Nose: As expected, this is briny and coastal, with soft smoke and rich caramel. Then we get some rather muffled dark sherry notes, mostly sultanas and dark fruits. There’s also ginger, blood oranges, cinnamon, wine tannins, molasses, dark chocolate, and damp leaves. A previous review mentioned bran, which is also a BIG part of this whisky. This is very different from the 12. The coastal, gently smoky house style is ever-present, but this is much sturdier. I like it. The bran note here is really special, and I also enjoy the calm, but powerful wood notes. But when compared to the 12, there’s by far less dynamism here. I absolutely loved this the first time I tried the 18, but after revisiting it several times, I haven’t noticed any interesting or new developments. I think this is almost TOO sturdy. There’s very little change that happens in the bottle or in the glass. This tastes the same now as it did when I first opened it. Once you’ve tasted it once, you’ve tasted it 100 times. The consistency of flavours and the controlled quality of this whisky do give the 18 a certain elegance, but I feel it’s sacrificed that vitality and dynamism that makes the 12 such a beautiful and interesting drink. But this is still a distinctive and absolutely delicious whisky. Recommended. I bought a bottle of the 12 around a year ago and reviewed it. I loved it. I couldn't resist the urge, so I purchased a bottle today. Excellent whisky. Drinking the 12 today and reading your review makes me want to splurge and get me the 18 soon. You make the 18 sound very interesting. Can you not find it in Missouri? As far as I know it's pretty widely available. (First vapor: Leather fades right away.) Nose: A distinct smell of whole-grain wheat bread: Bran. A few minutes of breathing turns this sweeter, with vanilla and caramel. Cashews-- and then a faint ocean spray-- keep it serious and bring depth. Wisps of orange rind may tickle the nose. Overall impression is of salty caramel on bran. Palate: First a surprise splash of sourness. It lasts long, like recovering from an accidental intake of seawater.... But lying behind this arrive some sweet over-toasted nuts. As in the nose, their sweetness (from vanilla/brown sugar) is tempered by some saltiness and bran. Finish: Oaky pepper crescendos while nuts fade out. Liquorice arrives at the back of the tongue, and then an impression of cinnamon.... then gone. The contrasts of sweet and savory make an intriguing nose, and the bread scent is unique. Unfortunately, the sour entrance doesn't dissipate fast enough, leaving too little time to appreciate these elements developing in the palate. Nose: Green-grapey sherry, significant chalkiness. Some salt spray, hint of lemon pith and steamed wheat grain. Palate: Salty oil and Juicy white wine, with dry yeasty wheat. Chalky again, and charred as well. Finish: Chalky and rounded taste of aged oak, slightly biley lemon pith but not too bad, instead compensated by white wine tones that eventually dry. I rate it 85, find it very similar but a step up from the 12yo. I think Laphroaig's An Cuan Mor is very similar. I completely agree with indynoir's comments and I was surprised to see your mention of whole grain wheat bread - I took notes on this one last night and wrote down that very same descriptor, which I thought was unusual. I don't get the sourness, but I do get the drying aspects that probably come from the Spanish oak sherry casks - I love the sweet and dry combination. One of my very top whiskies that isn't a Glenfarclas! Upon opening, there is a definite nose of vanilla, caramel, soft leather, and a certain "sweetness". For an Islay, there is very little of the smoke and peat one would usually expect. That is obviously what sets this whisky apart from it's well-smoked brothers. The palate is quite similar to the nose - sweetness, vanilla and caramel, with the barest hint of peat and brine. Definitely one of the sweetest whiskies, especially for an Islay, that i have ever experienced. It is also an oily whisky which keeps the mouth coated after swallowing. The aftertaste is a bit spicy, with cinnamon and licorice, but it is a very short aftertaste. Overall, a smooth dram and very straightforward, with very little complexity or depth. Remember Bunna is pratically unpeated, it might have some brine in the background of the palate but besides that you are getting something much softer than the standard Islay. Nose: Chocolate covered nuts, vanilla, brine, salted nuts, blackberries, sea breeze, seaweed. Water brings out some citrus. Seems older than 18. Taste: The nuttiness continues with Nutter Butters, sawdust, charred wood, and buttered toast. Very creamy and mouth-coating. Finish: A tiny dash of peat and a great vanilla ice cream note with a bit of cinnamon at the very end. This is quite a unique whisky and it's unfortunate that it doesn't get enough attention. Granted, I wouldn't call this the most complex whisky I've ever encountered, but it is of very high quality and it's very mature for it's age. It's obvious to me that the new ABV has elevated this malt tremendously. Go ahead and try it. Hi OJK Just wrote my review of this 18yo and I am completely with you. I liked the whisky before the finish. But this bitter-sour taste, like you described it very well 'herbal medicinal' downgraded this whisky maybe 10 points. "grandpa damp wood" — ha! fantastic review.